There is a general lack of awareness about the contribution of military leaders towards sustaining the country's integrity and in maintaining democracy, stability and harmony. 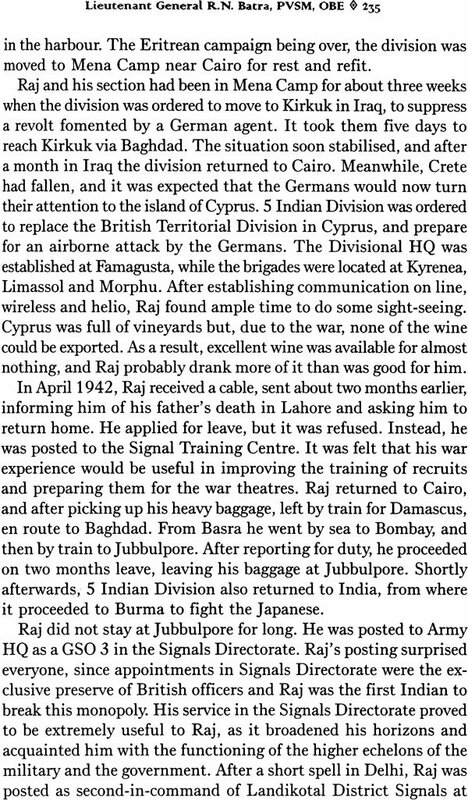 The record of the Indian Army has been impeccable in this regard but it is a story seldom heard outside mess halls. It throws new light on many historical events and the role of political leaders during India's fight for independence and the partitioning of the subcontinent. Gives an overview of India's military history after independence, including major operations such as the wars with China in 1962, and with Pakistan in 1947, 1965 and 1971. Describe many hitherto unknown or little known facts and incidents concerning smaller operations like Nathu La in 1967 and in 1962. Based on almost 10 years of research, this absorbing book will attract a broad readership. In particular, it will be interest to students of military history, strategic studies and contemporary India besides being essential reading for all defense personnel. 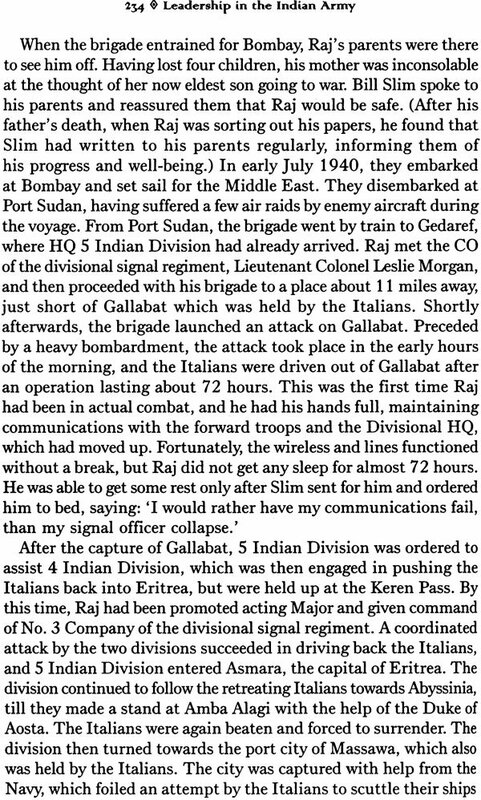 Major General V.K Singh passed out from the Indian Military Academy, Dehradun, in June 1965 and was commissioned into the Corps of Signals. In his career spanning 37 years he held several important posts, including that of Chief Signal Officer of the Western Command. 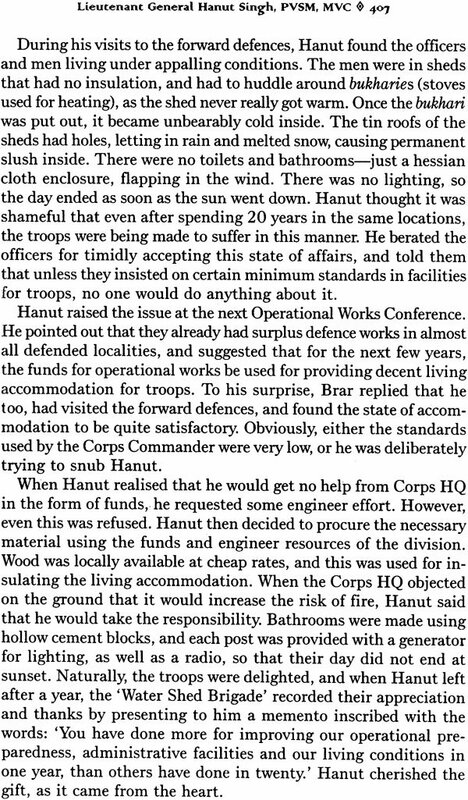 He is presently writing the second volume of the history of the Corps of Signals. In times of yore, history was often nothing more than a record of battles between kings and warlords. The effects of wars on human civilisation were more profound than that of any other activity of Man or God. Wars, and those who directed them, decided the fates of people. 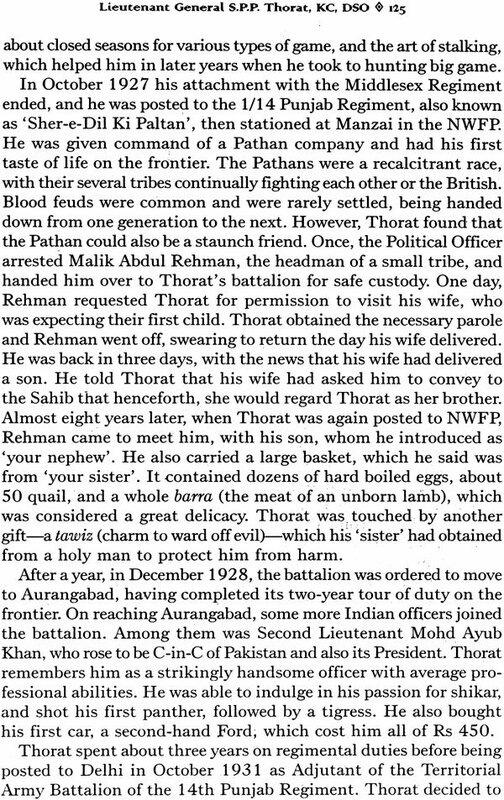 Military leaders were revered and feared, and tales of their valour were passed on from generation to generation, forming the bedrock on which histories were written. The growth of science and technology, trade, industry and economy has begun to overshadow the importance of wars and of those who fight them. Such thoughts and ideas were propounded after the Industrial Revolution two centuries ago and the Technological and Economic Revolutions which are of more recent vintage. However, the world witnessed two great wars in the last century, which together lasted 10 years. Even today, the threat of war has not receded. And as long as there are wars, there will be soldiers to fight them. In the ultimate analysis, it is the soldier and those who lead him who will decide the fate of peoples and of nations. The Indian Army is over 250 years old. 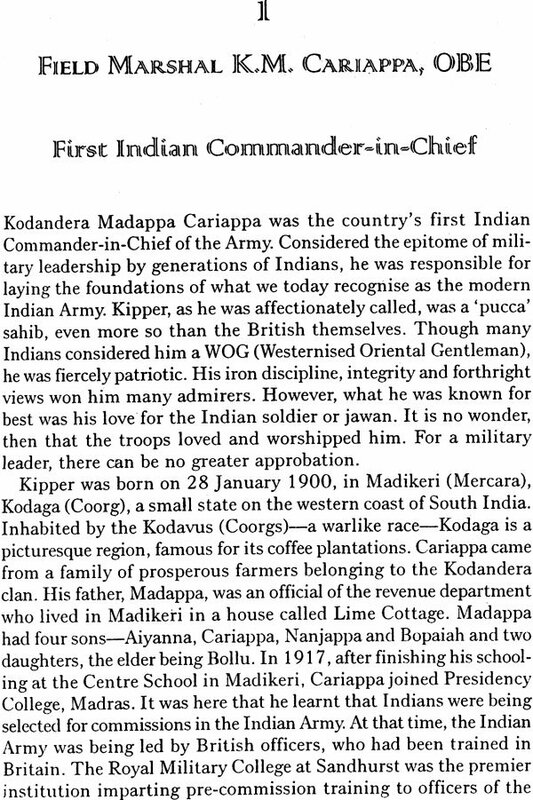 However, it was only SO years ago that it began to be led by Indians and became truly and completely Indian. Fifty years is not a long time in the history of a nation or an army. But nations and armies have had shorter life spans and SO years equal two human generations. Today, because of the growing distance between the soldier and the common man, there is a lack of awareness in the general public about military leaders and their contribution towards maintaining the integrity of the country. It is well to remember that military leaders serve the nation not only during war but also in times of peace, by helping to maintain stability and harmony. Indians have only to look in their neighbourhood to realise that soldiers cannot only be protectors, but also the plunderers of democracy. 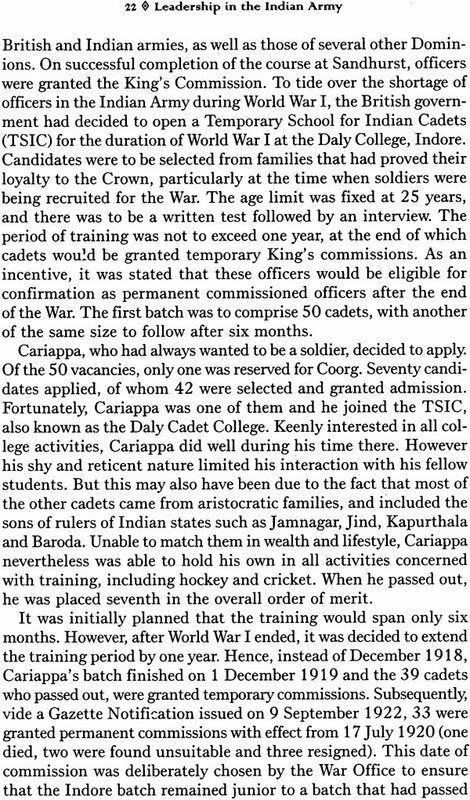 The record of the Indian Army in this regard has been impeccable and the credit for this must go to leaders like Cariappa, who kept the Army away from politics and welded it into a force that exemplifies national integration. The Indian public must recognise the sterling contributions of its military leaders, not only to protecting the Nation's sovereignty, but also her social fabric, cultural identity and democratic traditions. 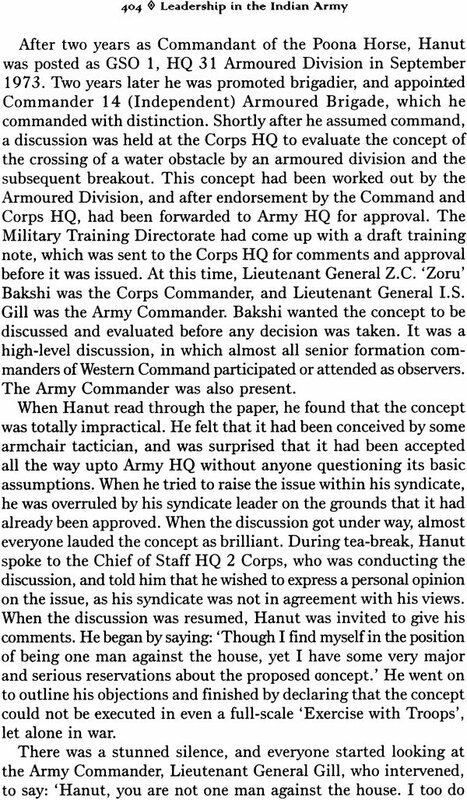 The generals included in this book were all leaders. It should be remembered that the government appoints generals while leaders have to prove themselves. Not all generals are leaders-if they were, Norman Dixon would have had a difficult time finding subjects for his book, On The Psychology of Military Incompetence. Unlike other callings, the military profession provides the ideal platform for a good leader to prove himself, as it does for the incompetent one to be exposed. One quality which all these leaders share is strength of character-a virtue which has all but vanished from public life; even among soldiers, only vestiges remain. It is hoped that their stories will inspire our youth, especially those who intend joining the profession of arms. I must confess that the major difficulty was not in deciding which general to include, but the ones to be left out. There are scores of others who merit inclusion, if the criteria of good leadership and strength of character alone were to be applied. The only reason that I can offer for keeping the list short is space and time. 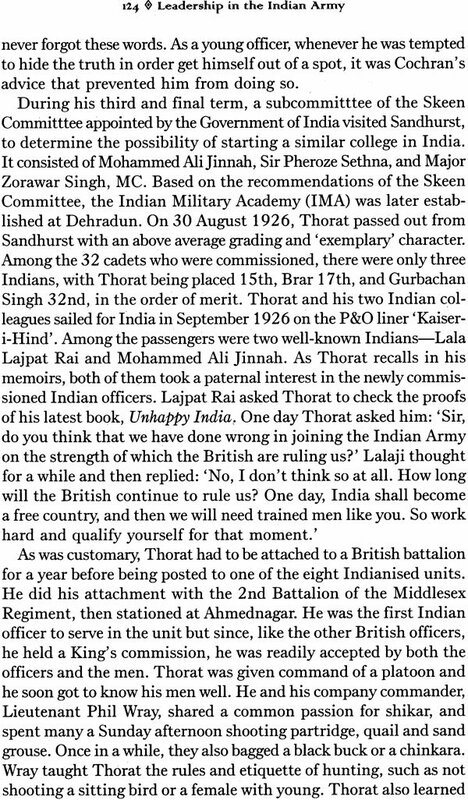 To those who have not found a place in this book and their admirers, I can only say that this in no way reflects on their leadership and standing in the Indian Army. I am certain that their valuable Contributions will be recognised and documented, if this has not already been done. Work on this book was begun more than 10 years ago, and it was not an easy task to get information about the leaders who are no more. 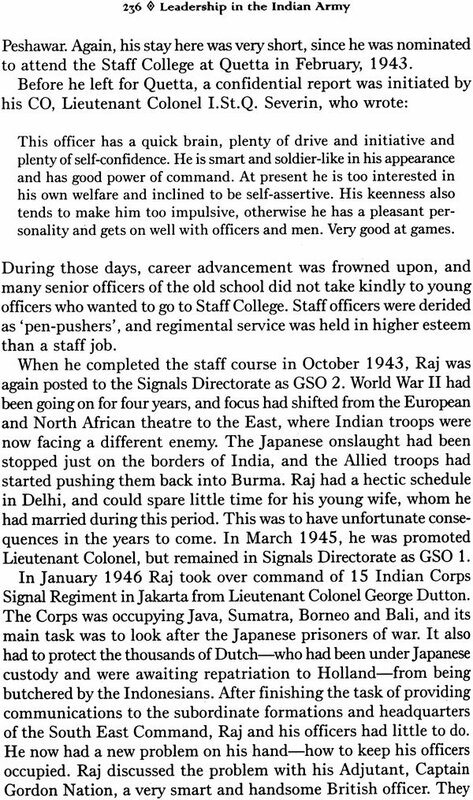 Since the intention was not to write a purely professional biography but also to bring out characteristic traits, reliance had to be placed on personal accounts of people who knew these leaders, rather than written records such as regimental histories, war diaries, etc. 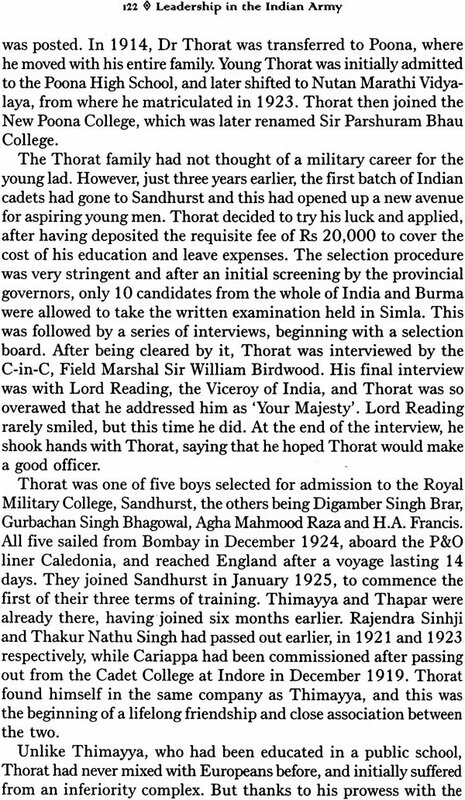 Of course, biographies have been written of Cariappa, Thimayya and Bhagat, and autobiographies of Thorat and Sinha. These have been extensively relied upon and quoted. But for the rest, whatever appears in this book has been culled from various sources, including books, articles and personal narratives. Some of these leaders are legendary figures and their exploits are part of the folklore of the Indian Army. 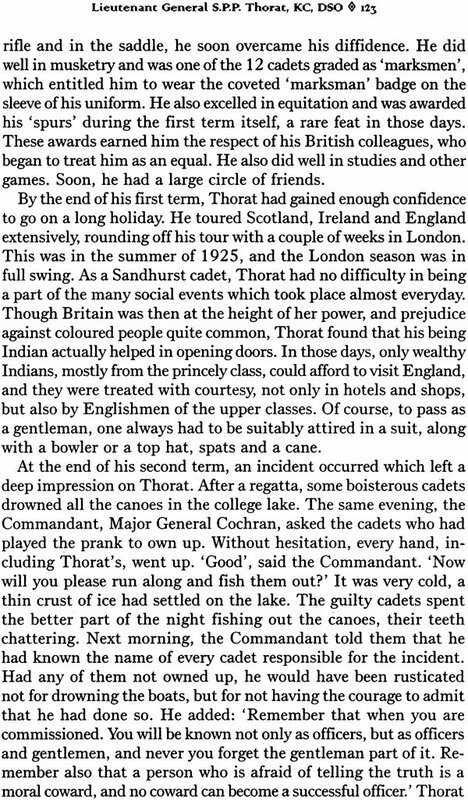 Many of the incidents and anecdotes described in this decorated for gallantry. 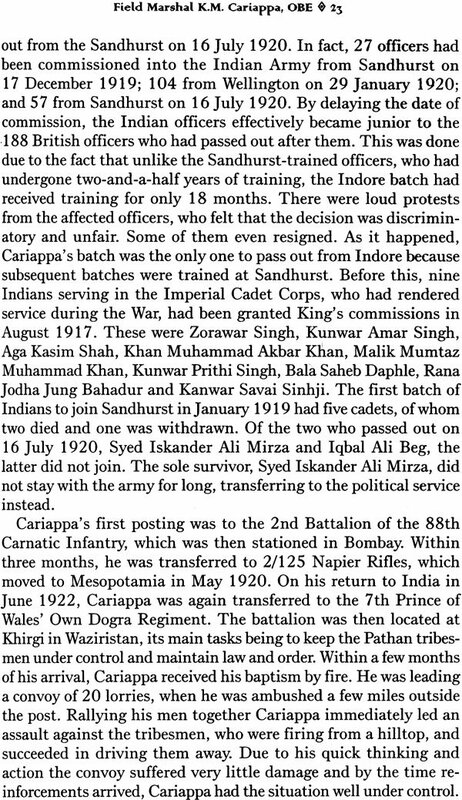 There was one VC (Bhagat): three MVCs (Bakshi, Hanut and Usman): two DSOs (Thimayya and Thorat); one VrC (Bakshi); and one MC (Manekshaw). In most nations, the contributions of famous military leaders are recognised by national awards. In Britain, they are elevated to the peerage, or knighted. 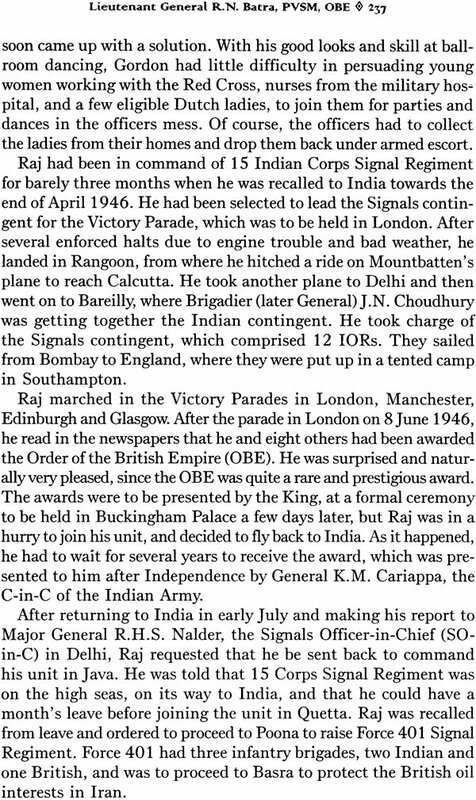 Even Indian military leaders were given such honours, for example, Cariappa and Batra were given the Order of the British Empire (OBE). After Independence, a new series of awards was instituted. Starting from the Bharat Ratna, in descending order, they are the Padma Vibhushan, the Padma Bhushan and the Padma Shri. 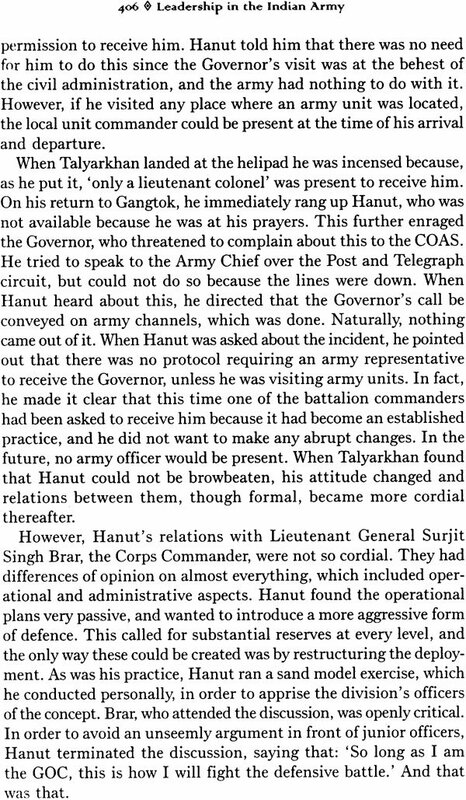 Of the military leaders profiled in this book, Manekshaw and Sagat were awarded the Padma Vibhushan; Thimayya the Padma Bhushan; and Thorat the Padma Shri. 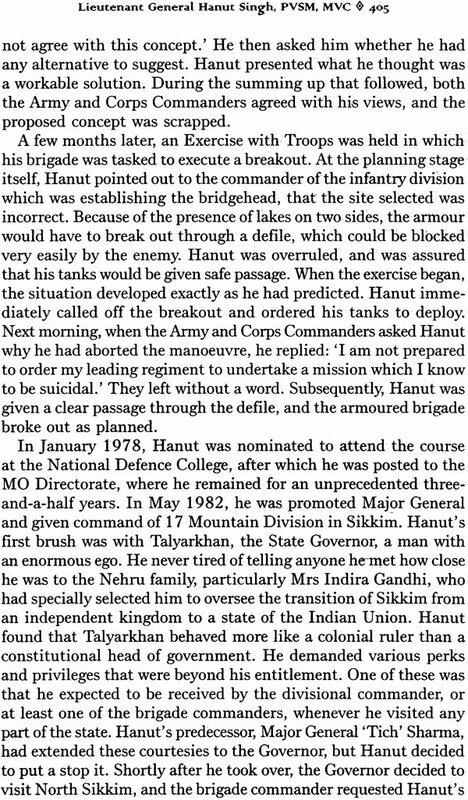 Strange as it may seem, none of our military leaders was awarded the Bharat Ratna. 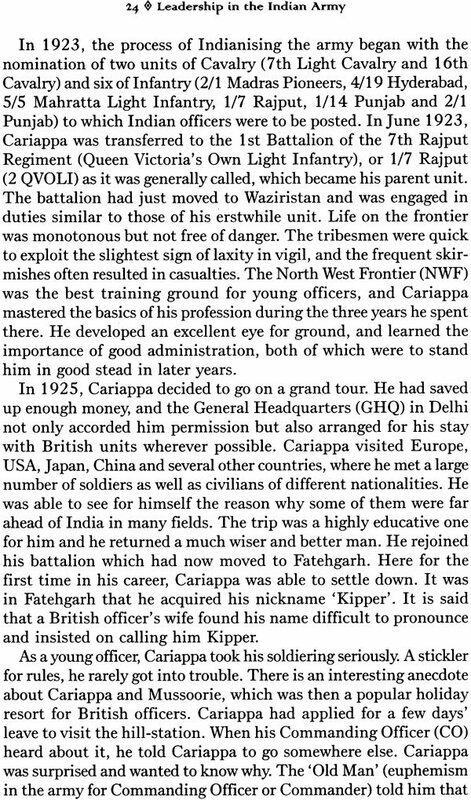 Are the contributions of Cariappa and Manekshaw towards the Indian nation in any way less than those of the politicians, scientists, academics, industrialists and musicians who have been honoured with the nation's highest award? The adage about soldiers being remembered only during adversity and being quickly forgotten afterwards was never so true. Without apologising for beginning with a rather cliched phrase, because it is true, I would like to say that it is a pleasure and a privilege to write this. A pleasure, as the author is one whose talent and friendship I cherish. A privilege, as the motives impelling the book are laudable. A trifle too often our heroes tend to be men in white, whereas the ones in fatigues are all but ignored. The soldier's exploits are expected to be confined to the battlefield; similarly his honours. Yet written history is, unfortunately, rarely accurate, and the contributions of such men towards nation-building are often conveniently glossed over. Moreover, the soldier is confined to a stereotype whose human face is often to be seen only in mess-hall lore, and never outside military circles. Setting right the historical perspective, analysing qualities that give these men the right to be honoured, both for their leadership and their vision, giving credit where it is due and, most of all, bringing out the human face behind the military facade is what the author has succeeded in doing here. This is important as, without knowledge of the truth, history degenerates into a story with little significance for those who seek to better the future from the lessons of the past. Nor does the task seem to have been an easy one. To gather information traditionally never archived is a daunting task. It involves identifying, locating, contacting and interviewing people scattered all over the nation, or even the world. Then, of course, lies the equally, if not more, daunting task of verification and cross-verification. A painstaking process and a long one! In this particular case, all of five years! I sincerely hope that this book will prove invaluable to academics and to the average Indian who seeks to serve his motherland better by acquainting himself with unknown facts and facets of those who have shaped her history. Moreover, if it inspires the youth of the nation to follow the footsteps of the great men whose lives have been detailed here, the author’s pains will not have been in vain.